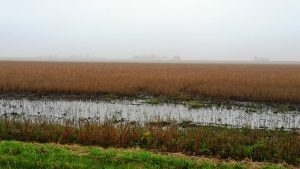 The first official tour of the nation’s fields this summer resulted in better crop yield and production estimates than the market was expecting. The national corn yield estimate came in at 169.5 bushels per acre, down 1.2 bushels from trend, but that was still a couple of bushels above trade expectations. If realized that points to a 14.15 billion bushel corn crop, which would be the 3rd largest ever, continuing a string of large corn crops. The soybean yield estimate was 49.4 bushels per acre. That is 1.4 bushels above trend and sets up this year’s crop to exceed last year’s. So bushels and bins would continue to overflow with these estimates. On the demand side, news was mixed. Soybean export projections were raised 75 million bushels, but domestic soybean crush was lowered by 10 million. Corn feed usage and exports were reduced by 25 million bushels each. Combined, the corn adjustments shrank 2017/18 ending stock projections by 52 million, but stocks are still projected above 2.25 billion bushels. For soybeans, ending stock projections rose by 15 million bushels, to 475 million. For prices, USDA held their price range for corn, leaving the midpoint at $3.30 per bushel. While for soybeans, the price range tightened a bit, losing a bit more than the high end than the low, with the midpoint now at $9.30 per bushel. Steven D. Johnson, Ph.D., Farm Management Specialist, Iowa State University Extension and Outreach, shared marketing tools and tips for the 2016 crop. 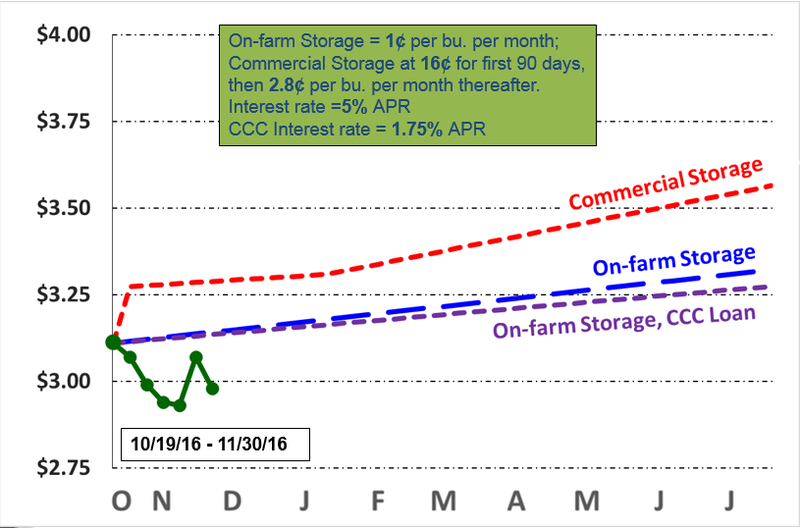 Keep an eye on your local basis to see if you should continue to store or price some of your corn. Farmers who have unpriced corn might consider using a basis contract to market at least a portion of those bushels. 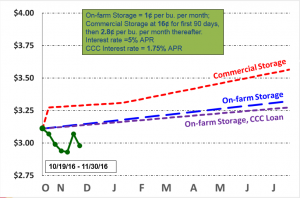 An attractive basis in late December and the need for cash will be the main drivers for farmers to move some of those stored bushels. Most of the cash price movement in late fall and early winter months typically comes from better basis being offered as farmers slow grain movement. In addition, two 3-day weekends in late December increase the odds of potential “quick ship” bids to meet processor demands for additional bushels. Seasonal futures price trends indicate corn futures prices don’t typically rally in the fall and winter months. That’s because most everything is known about the Northern Hemisphere feed grain crops by then, and that’s where nearly 85% of the world production takes place. However, most farmers will be reluctant to give up ownership of bushels at sub-$3.50 per bushel cash corn prices. Compare the cost of storing corn at a commercial elevator to your own on-farm storage costs. 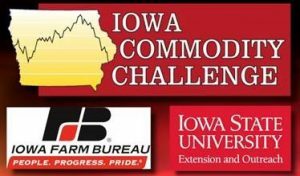 The ISU Extension and Outreach Iowa Commodity Challenge website can show you how. It uses the following 2016 crop assumptions: cash corn is valued at $3.11 per bushel at a central Iowa elevator when about 50% of the Iowa harvest was complete. Interest is accruing on stored grain at a rate of 5% or 1.75% if the USDA marketing loan is used. On-farm storage is 1 cent per bushel per month while commercial storage is 16 cents for the first 90 days and 2.8 cents per bushel for each month thereafter. Note the cash prices (dotted line) are below the typical cost of corn ownership as of late November. Once you store corn, imagine how much cash prices will need to improve each month to justify storage. Commercial storage could easily be 3 to 4 times more expensive per bushel than on-farm storage costs. The cash price received for commercially stored bushels will also reﬂect the basis offered at that commercial storage facility. If history is any indication, the likelihood of selling those cash corn bushels above the cost of storage probably means a significant futures price rally is needed (more likely in the spring months)and improvement in the basis. How does a basis contract actually work? Most grain merchandisers offer a marketing tool called a basis contract. 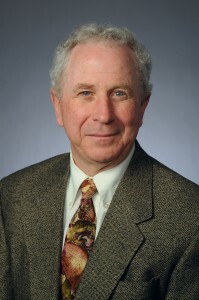 A farmer delivers cash corn and eliminates storage costs and basis risks. The merchandiser buys a corn futures contract (goes long) in a deferred month on behalf of the farmer. The merchandiser will likely charge a small service fee of 1 to 2 cents per bushel subtracted when the basis contract is settled, likely in the spring. Upon delivery of the cash bushels, a farmer can collect 70% to 80% of the corn’s value. The merchandiser holds the remaining 20% to 30% balance of the cash value to make potential margin calls should futures prices decline. Any excess funds minus the 1- to 2-cent service fee are returned to the farmer upon settling the basis contract. 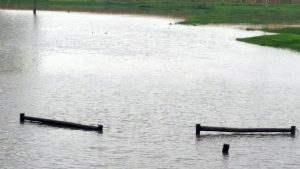 The farmer needs to convey to the merchandiser a date and price at which the farmer wishes to have this long futures position lifted. Consider being “long” the May 2017 or July 2017 corn futures contracts when using a basis contract to increase the chance of beneﬁting from a spring futures price rally. Discuss risks and rewards with your merchandiser when you’re initiating cash sales and basis contracts. Be sure you understand the risk of being “long” futures and the ﬂow of cash funds involved in the transaction. The farmer isn’t able to take advantage of the carry offered in the futures markets with a basis contract. However, there are several advantages a basis contract provides. Those include providing cash to help pay expenses and meet your farm operation’s cash flow needs, elimination of storage costs and basis risk, and minimizing the concern for on-farm stored corn quality. The website featuring the Iowa Commodity Challenge has related crop marketing information including 14 videos and a 65-page Marketing Tools Workbook. Steve Johnson, ISU extension field specialist, shares details on the Iowa Commodity Challenge, a program developed with Chad Hart, ISU extension economist and Ed Kordick, Iowa Farm Bureau, offers simulation using real world prices to help explore various marketing strategies. The Iowa Commodity Challenge is an educational series developed by Iowa State University Extension and Outreach and the Iowa Farm Bureau that reflects real world crop markets so users can explore how various tools work – without putting their actual money on the table. 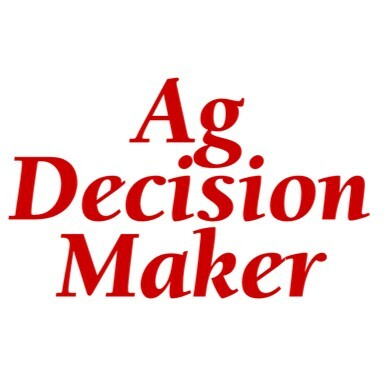 The materials, hosted on the Ag Decision Maker website, include 14 instructional videos explaining various aspects of marketing. Three new videos – Successful Market Planning, Using Crop Contracts and Working with Your Grain Merchandiser – have been recently added. Also included is an updated 65-page Marketing Tools Workbook and a variety of learning activities. The workbook provides the basics on marketing tools as well as setting personal marketing goals and resources participants can use on their own farm operation. Participants can choose to participate in an online grain market simulation game to help improve marketing skills. The game includes using futures and ag options as marketing tools, and participation can also help users improve strategies to sell cash corn and soybeans. As a part of the online grain market simulation game; participants are given 75,000 bushels of corn and 25,000 bushels of soybeans stored commercially to market before spring using March 2017 corn and soybean futures. Storage costs will accrue on bushels as if they were in the bin (six cents per bushel per month). Crop marketing is difficult and the stakes are high. Participating in the Iowa Commodity Challenge will provide greater understanding of marketing tools available and aid in making decisions in the noisy world of crop marketing. USDA updated its projections for the 2016 corn and soybean crops. And while the national corn yield is reduced, the national soybean yield is increased and record production is still on the books for both crops. The national corn yield is set at 173.4 bushels per acre, down a bushel from last month, but still 2.4 bushels above the previous record set in 2014. With the yield this high, a 15 billion bushel corn crop is projected to be heading in from the fields during harvest. Combined with the 1.7 billion bushel carryover, total corn supplies for the 2016/17 marketing year stand at 16.85 billion bushels. Corn usage is also projected at record levels, but demand has not been able and is not projected to keep up with the supply surge. Corn export projections are raised 50 million bushels, bringing total usage up to a record 14.5 billion bushels. The end result is an ending stock level roughly 600 million bushels higher than we had for the 2015/16 marketing year, but slightly lower than last month’s estimate. That slight tightening of ending stocks gave USDA a little room to raise their projected price range by 5 cents per bushel, with the midpoint now at $3.25 per bushel. The national soybean yield is projected at 51.4 bushels per acre, up 0.8 bushels from last month and well above the previous record. With production approaching 4.3 billion bushels, the soybean market has never had more beans to work with. So again, it’s a story of record supplies and demand, but demand growth lags behind supply growth. Soybean export projections are raised 40 million bushels, bringing total usage to 4.1 billion bushels. But ending stocks are projected to double and price projections are held steady, with the midpoint of the season-average farm price range set at $9.05 per bushel. Stock levels for corn and soybeans were up in the most recent USDA report, but the trade expected that as we move into the next marketing year. Corn ending stocks were estimated at 1.74 billion bushels, up just 6 million bushels from last year. While total corn stocks are about the same, farmers are holding more back on the farm than they did last year. Strong demand from the ethanol and export sectors boosted June-August corn disappearance by 9 percent. For soybeans, we entered the 2016/17 marketing year with 197 million bushels in storage. That’s 3 percent above last year’s level. And reversing the pattern for corn, less soybeans are being held by farmers on the farm. Summer crush and export demand were firm as well, with June-August soybean disappearance increasing by 55 percent. So the stocks report confirmed strong demand for corn and soybeans, but stocks still grew year-over-year. The July updates from USDA pushed both crop supplies and demands higher. But in the longer run, stock levels are projected to be higher, with steady to lower prices. On the supply side, the revised acreage and stock numbers from last month were fully incorporated into the projections. Corn production was increased by 110 million bushels, while soybean production rose by 80 million. On the demand side, there were several offsetting moves. For corn in both old and new crop settings, feed and ethanol usage were lowered, while food and export usage rose. 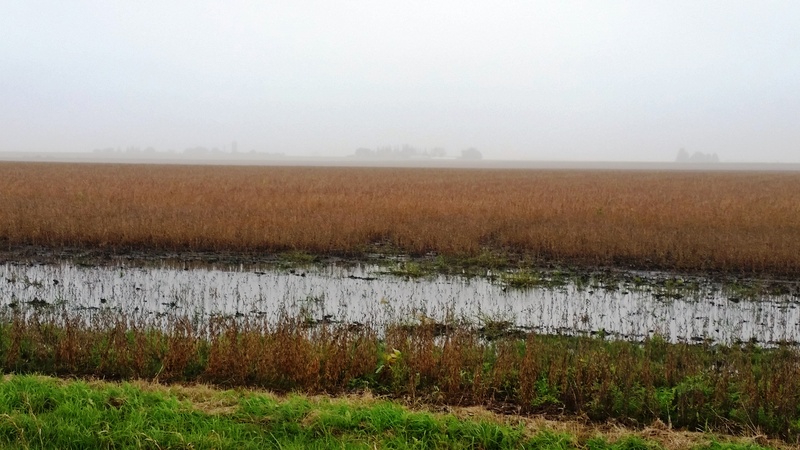 For soybeans, export demand was increased for both old and new crop. Crush demand was lifted slightly for the new crop, but seed and other uses were lowered for the old crop. Putting all of the shifts together results in slightly lower old crop ending stocks, but higher new crop (2016/17) stocks. Season-average prices were held steady for soybeans, at $9.05 for the 2015/16 crop and $9.50 for the 2016/17 crop. Corn season-average prices were reduced by 5 cents on the 2015/16 crop to $3.65 per bushel and by 10 cents on the 2016/17 crop to $3.40 per bushel.